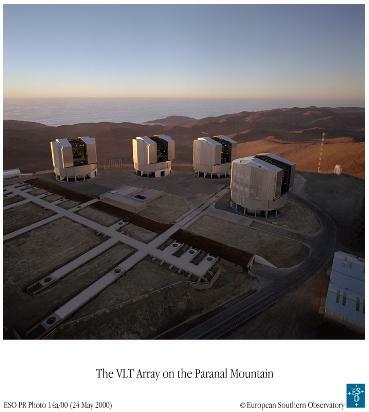  The team used the VLTI visitor instrument PIONIER, which is able to interferometrically connect all four Auxiliary Telescopes or all four Unit Telescopes of the VLT at the Paranal Observatory. This led to not only extremely high resolution of the targets but also allowed for a high observing efficiency. 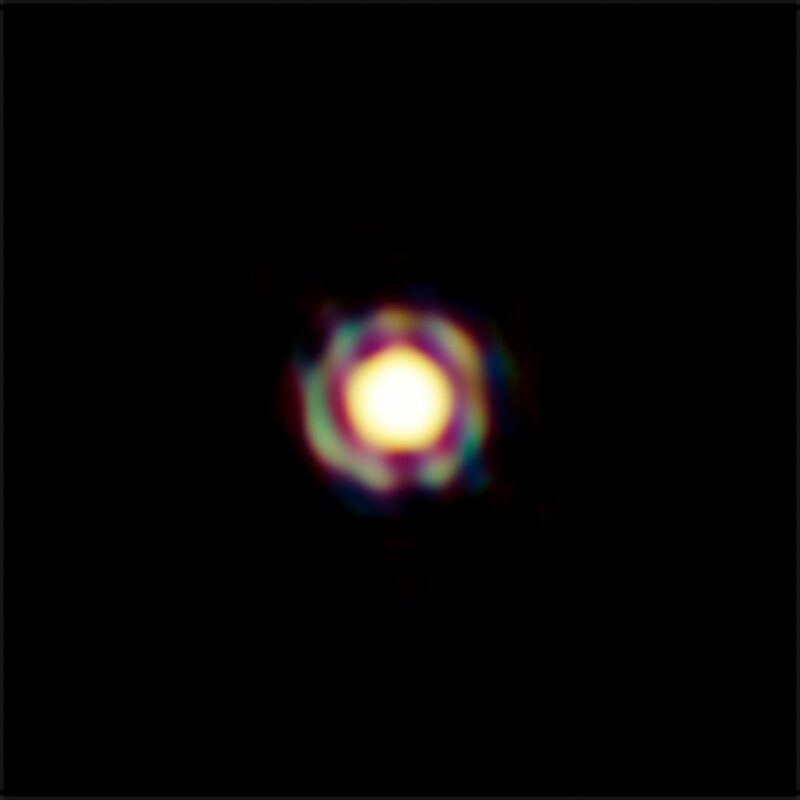 Previous observations were made with the CHARA array — an optical astronomical interferometer operated by the Center for High Angular Resolution Astronomy (CHARA) of the Georgia State University, and its fibred beam combiner FLUOR. As a by-product, these observations have also led to the discovery of new, unexpected stellar companions orbiting around some of the most massive stars in the sample. “These new companions suggest that we should revise our current understanding of how many of this type of star are actually double,” says Lindsay Marion, lead author of an additional paper dedicated to this complementary work using the same data. ESO has just  released a stunning new image of a field of stars towards the constellation of Carina (the Keel). 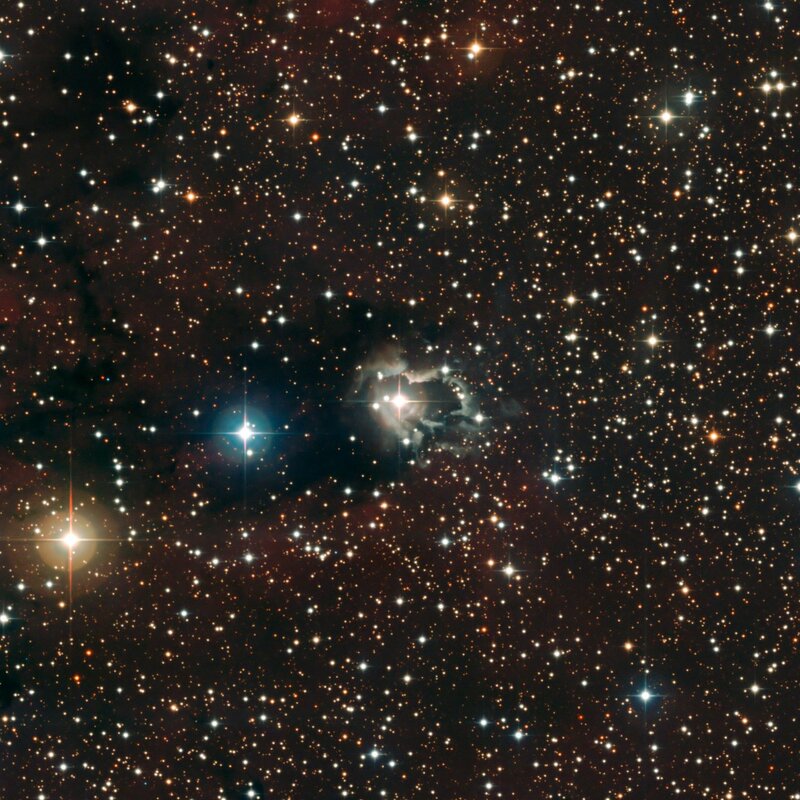 This striking view is ablaze with a flurry of stars of all colours and brightnesses, some of which are seen against a backdrop of clouds of dust and gas. One unusual star in the middle, HD 87643, has been extensively studied with several ESO telescopes, including the Very Large Telescope Interferometer (VLTI). Surrounded by a complex, extended nebula that is the result of previous violent ejections, the star has been shown to have a companion. Interactions in this double [binary star] system, surrounded by a dusty disc, may be the engine fuelling the star’s remarkable nebula. 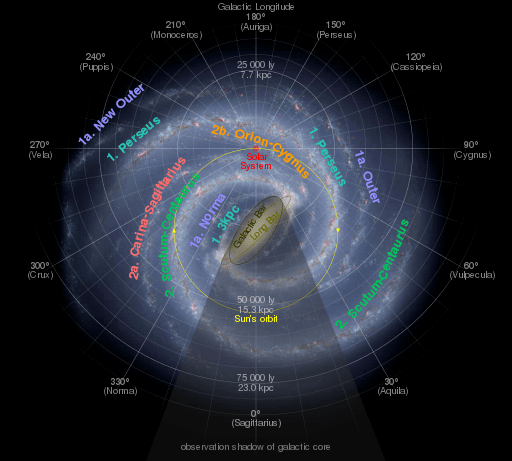 Observed structure of the Milky Way’s spiral arms. The [above star field] image was obtained with the Wide Field Imager (WFI) attached to the MPG/ESO 2.2-metre telescope at the 2400-metre-high La Silla Observatory in Chile. The image shows beautifully the extended nebula of gas and dust that reflects the light from the star. The central star’s wind appears to have shaped the nebula, leaving bright, ragged tendrils of gas and dust. A careful investigation of these features seems to indicate that there are regular ejections of matter from the star every 15 to 50 years. 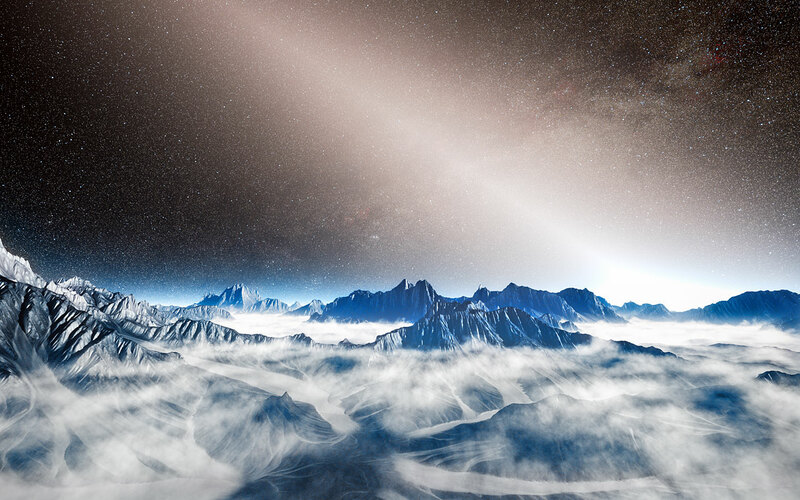 At the VLT, the astronomers used the NACO adaptive optics instrument, allowing them to obtain an image of the star free from the blurring effect of the atmosphere. To probe the object further, the team then obtained an image with the Very Large Telescope Interferometer (VLTI)[above]. The work on HD 87643 has been published in a paper to appear in Astronomy and Astrophysics: A binary engine fueling HD 87643’s complex circumstellar environment using AMBER/VLTI imaging, by F. Millour et al. Using different state-of-the-art techniques on ESO’s Very Large Telescope, two independent teams of astronomers have obtained the sharpest ever views of the supergiant star Betelgeuse. They show that the star has a vast plume of gas almost as large as our Solar System and a gigantic bubble boiling on its surface. These discoveries provide important clues to help explain how these mammoths shed material at such a tremendous rate. Betelgeuse — the second brightest star in the constellation of Orion (the Hunter) — is a red supergiant, one of the biggest stars known, and almost 1000 times larger than our Sun. It is also one of the most luminous stars known, emitting more light than 100000 Suns. Such extreme properties foretell the demise of a short-lived stellar king. 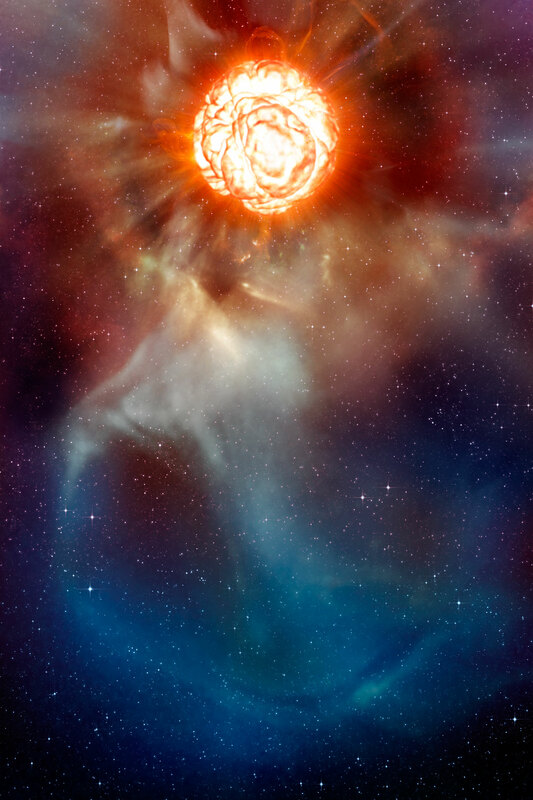 With an age of only a few million years, Betelgeuse is already nearing the end of its life and is soon doomed to explode as a supernova. When it does, the supernova should be seen easily from Earth, even in broad daylight. The AMBER observations revealed that the gas in Betelgeuse’s atmosphere is moving vigorously up and down, and that these bubbles are as large as the supergiant star itself. Their unrivalled observations have led the astronomers to propose that these large-scale gas motions roiling under Betelgeuse’s red surface are behind the ejection of the massive plume into space. ESO’s Very Large Telescope Interferometer has revealed the largest yellow star — and one of the ten largest stars found so far. 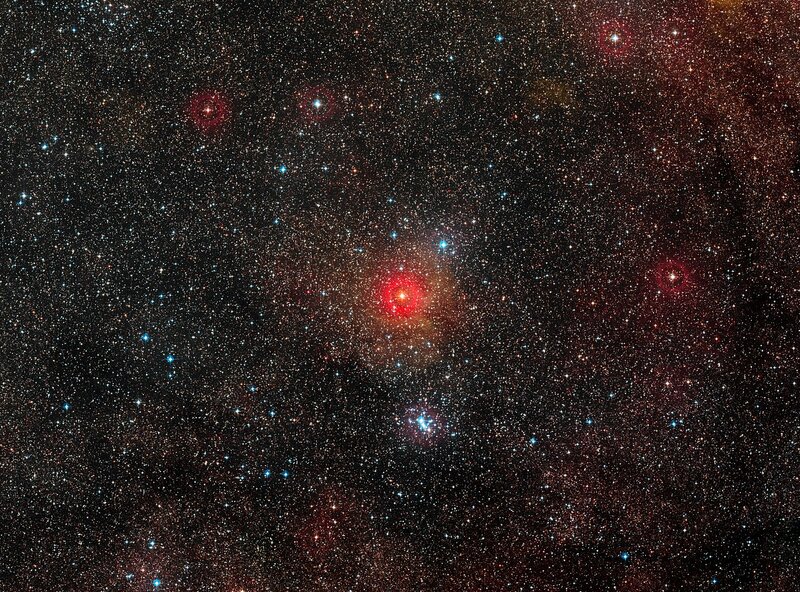 This hypergiant has been found to measure more than 1300 times the diameter of the Sun, and to be part of a double [binary] star system, with the second component so close that it is in contact with the main star. Observations spanning over sixty years, some from amateur observers, also indicate that this rare and remarkable object is changing very rapidly and has been caught during a very brief phase of its life. Using ESO’s Very Large Telescope Interferometer (VLTI), Olivier Chesneau (Observatoire de la Côte d’Azur, Nice, France) and an international team of collaborators have found that the yellow hypergiant star HR 5171 A is absolutely huge — 1300 times the diameter of the Sun and much bigger than was expected. This makes it the largest yellow star known. It is also in the top ten of the largest stars known — 50% larger than the famous red supergiant Betelgeuse — and about one million times brighter than the Sun. The astronomers made use of a technique called interferometry to combine the light collected from multiple individual telescopes, effectively creating a giant telescope up to 140 metres in size. The new results prompted the team to thoroughly investigate older observations of the star spanning more than sixty years, to see how it had behaved in the past. Despite its great distance of nearly 12 000 light-years from Earth, the object can just about be seen with the naked eye by the keen-sighted. HR 5171 A has been found to be getting bigger over the last 40 years, cooling as it grows, and its evolution has now been caught in action. Only a few stars are caught in this very brief phase, where they undergo a dramatic change in temperature as they rapidly evolve. Near-infrared images of the active galaxy NGC 1097, obtained with the NACO adaptive optics instrument on ESO’s Very Large Telescope, disclose with unprecedented detail a complex central network of filamentary structure spiralling down to the centre of the galaxy. These observations provide astronomers with new insights on how super-massive black holes lurking inside galaxies get fed. “This is possibly the first time that a detailed view of the channelling process of matter, from the main part of the galaxy down to the very end in the nucleus is released,” says Almudena Prieto (Max-Planck Institute, Heidelberg, Germany), lead author of the paper describing these results. NGC 1097 is a very moderate example of an Active Galactic Nucleus (AGN), whose emission is thought to arise from matter (gas and stars) falling into oblivion in a central black hole. However, NGC 1097 possesses a comparatively faint nucleus only, and the black hole in its centre must be on a very strict “diet”: only a small amount of gas and stars is apparently being swallowed by the black hole at any given moment. Astronomers have been trying to understand for a long time how the matter is “gulped” down towards the black hole. Watching directly the feeding process requires very high spatial resolution at the centre of galaxies. This can be achieved by means of interferometry as was done with the VLTI MIDI instrument on the central parts of another AGN, NGC 1068, or with adaptive optics. Thus, astronomers obtained images of NGC 1097 with the adaptive optics NACO instrument attached to Yepun, the fourth Unit Telescope of ESO’s VLT. These new images probe with unprecedented detail the presence and extent of material in the very proximity of the nucleus. The resolution achieved with the images is about 0.15 arcsecond, corresponding to about 30 light-years across. For comparison, this is only 8 times the distance between the Sun and its nearest star, Proxima Centauri. As can be seen in last year’s image, NGC 1097 has a very strong bar and a prominent star-forming ring inside it. Interior to the ring, a secondary bar crosses the nucleus almost perpendicular to the primary bar. The newly released NACO near-infrared images show in addition more than 300 star-forming regions, a factor four larger than previously known from Hubble Space Telescope images. These “HII regions” can be seen as white spots in the photo. At the centre of the ring, a moderate active nucleus is located. Details from the nucleus and its immediate surroundings are however outshone by the overwhelming stellar light of the galaxy seen as the bright diffuse emission all over the image. “Our analysis of the VLT/NACO images of NGC 1097 shows that these filaments end up at the very centre of the galaxy”, says co-author Juha Reunanen from ESO. An image of NGC 1097 and its small companion, NGC 1097A, was taken in December 2004, in the presence of Chilean President Lagos with the VIMOS instrument on ESO’s Very Large Telescope (VLT). See the full article with notes, here. ESO/J.-B. Le Bouquin et al. This image from ESO’s Very Large Telescope Interferometer is one of the sharpest colour images ever made. It shows the Mira-like star T Leporis in great detail. The central disc is the surface of the star, which is surrounded by a spherical shell of molecular material expelled from the star. In order to appreciate the feat of such measurement, one should realize that the star appears, on the sky, as small as a two-storey house on the Moon. The resolution of the image is about 4 milli-arcseconds. In this image, obtained by combining hundreds of interferometric measurements, the blue channel includes infrared light from 1.4 to 1.6 micrometres, the green, from 1.6 to 1.75 micrometres, and the red, from 1.75 to 1.9 micrometres. In the green channel, the molecular envelope is thinner, and appears as a thin ring around the star.